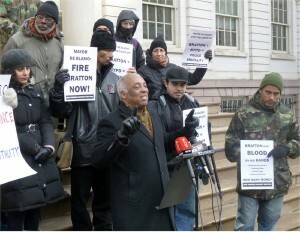 Home » Coast to coast » New York community activists tell mayor: Bratton must go! 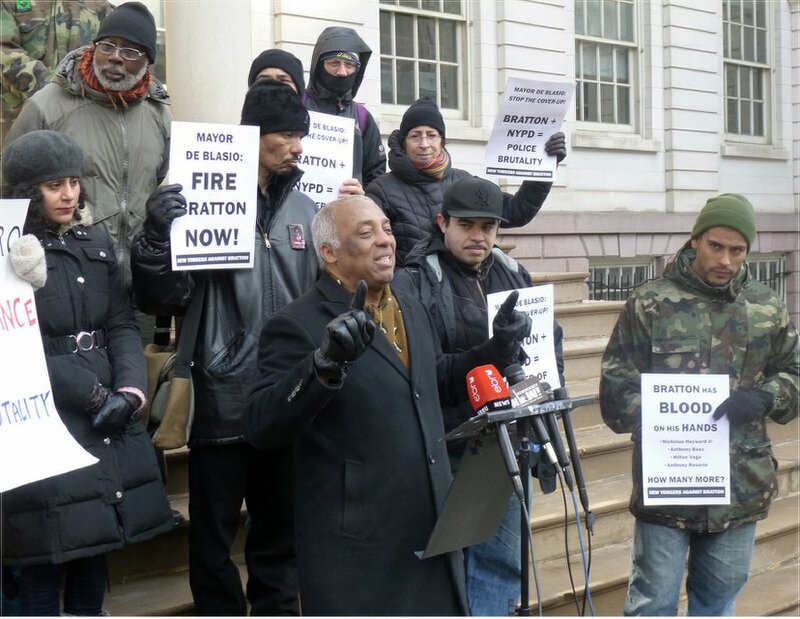 New York community activists tell mayor: Bratton must go! Charles Barron calls for firing of police commissioner. Activists, community members and families of police brutality victims held a news conference at City Hall on Feb. 4 to respond to claims by Mayor Bill de Blasio and Police Commissioner William Bratton that the problem of stop-and-frisk — the massive racial profiling program especially targeting Black and Latino/a youth — has been solved. “Just this past Thursday, Mayor de Blasio announced that the Bloomberg-era appeal of the Floyd v. New York stop-and-frisk case would be dropped, allowing for a federal judge’s reforms to take effect,” said Josmar Trujillo of the ad-hoc coalition New Yorkers Against Bratton. “While those affected by racial profiling can credit the efforts of plaintiffs and lawyers in that case, the return of Bill Bratton undermines any celebration or proclamations that the NYPD has been reformed. “Within the first month of Bratton’s return, New York has already seen a suspicious death in custody, a Latino student abused in Queens and an Asian senior citizen in Manhattan brutalized by the NYPD,” said Trujillo. Calling Bratton “the architect of stop-and-frisk,” public defender and activist Noha Arafa reviewed the NYPD commissioner’s long history of defending and promoting racial profiling, from his first stint in New York under arch-racist Mayor Rudy Giuliani from 1994 to 1996 to his recent heading of the Los Angeles police. Greg Butterfield of the International Action Center addressed de Blasio as a parent. “Like the mayor, I have two biracial Black children, and I am horrified at the prospect of them, their classmates and friends growing up in a city where Bratton is police commissioner. Speakers said that stop-and-frisk is only part of the systematic police terror against the city’s people of color, which includes brutality, impunity for killer cops, sexual assault, criminalization of students in public schools, and spying and infiltration of Muslim communities, which Bratton championed in Los Angeles. For updates and upcoming actions, search for New Yorkers Against Bratton on Facebook.